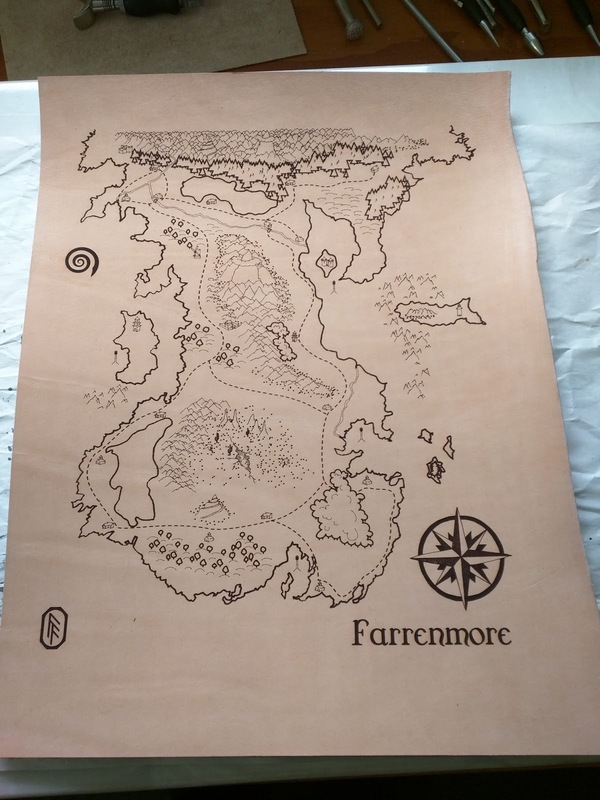 The client contacted me the day before the laser cutter arrived which turned out to be pretty good timing since a laser cutter was just the tool for what they had in mind. 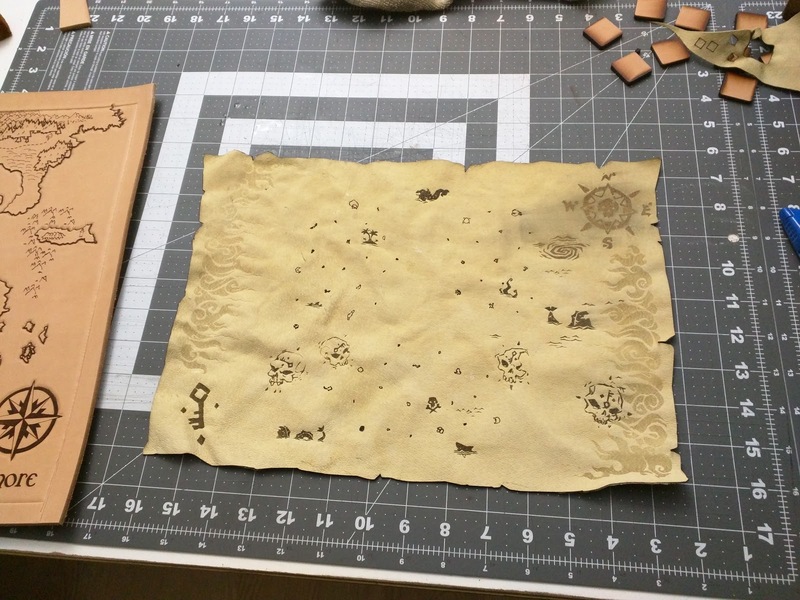 The client's a big fan of the pirate-y game Sea of Thieves and wanted a copy of the map they could carry around, roll up, fold, etc. Unfortunately there aren't many leather options that can do that while being carvable, durable, etc. 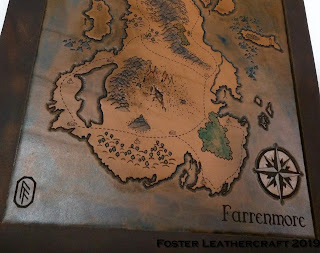 So I converted the original map into a draft and burned it onto a piece of suede. 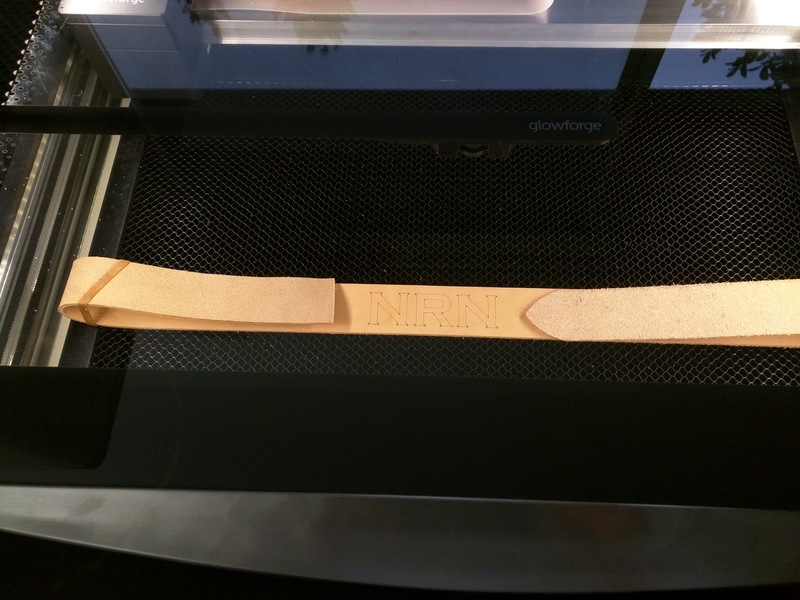 That worked pretty well, right down to having two different levels of engraving. 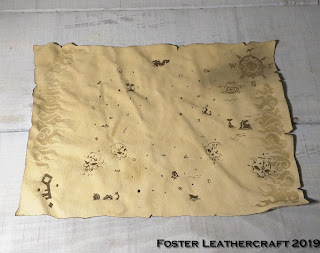 What I wasn't counting on was the soot that lays in all those deep black areas and started smudging around as soon as I pulled it out of the laser. This was bad enough around the compass that I scrubbed the soot off entirely which only kind of fixed the problem. I'm going to try out some other materials before adding something like this to the shop. Looks pretty snazzy though! 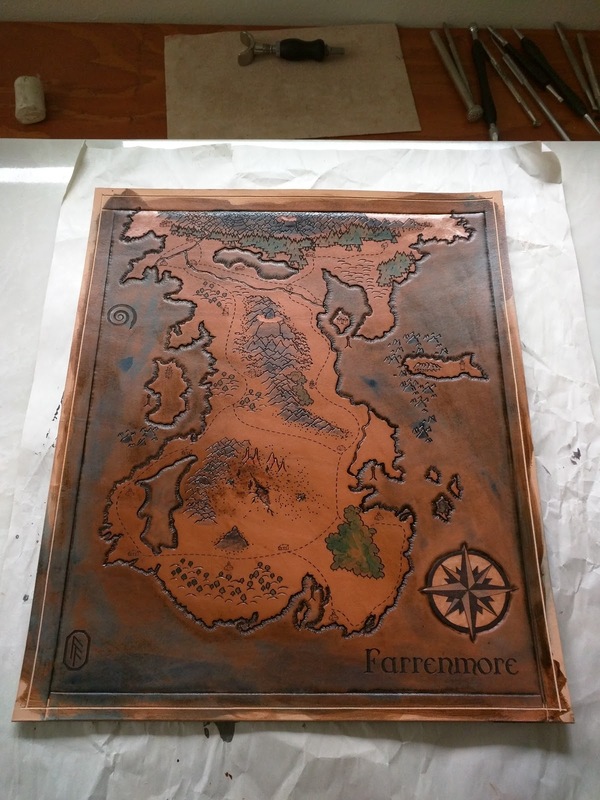 This was my first full-blown map to incorporate the laser cutter with traditional carving. 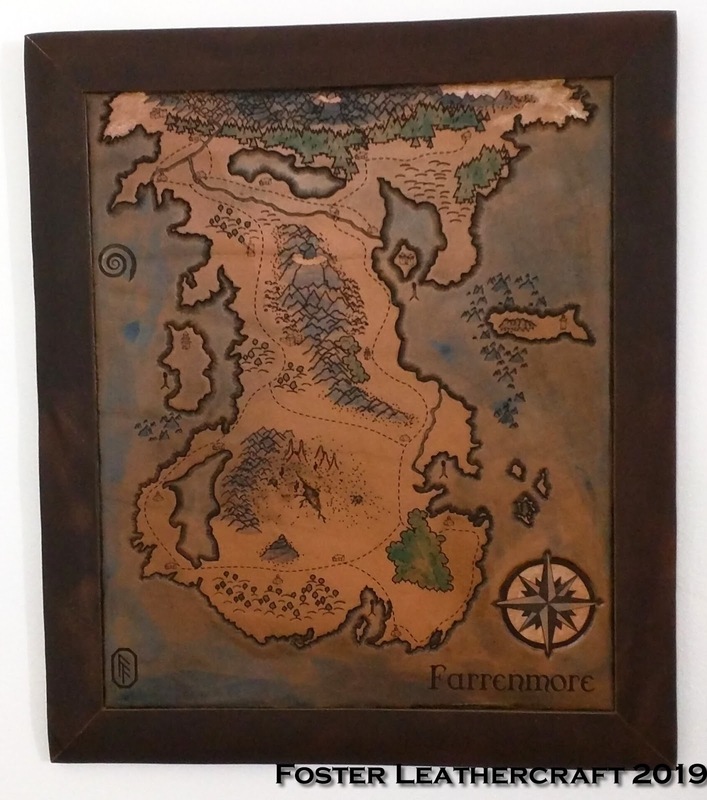 The original map was drawn back in the days of GeoCities and has been used in a campaign that's been unfolding since then. This venerable campaign was just wrapping up this year so the map needed to be something worthy of that. 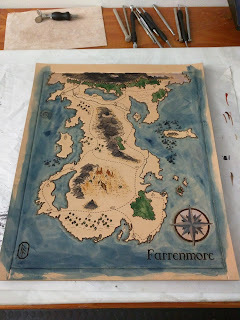 I started by turning the original into a draft which took about as much time as all the other steps combined. 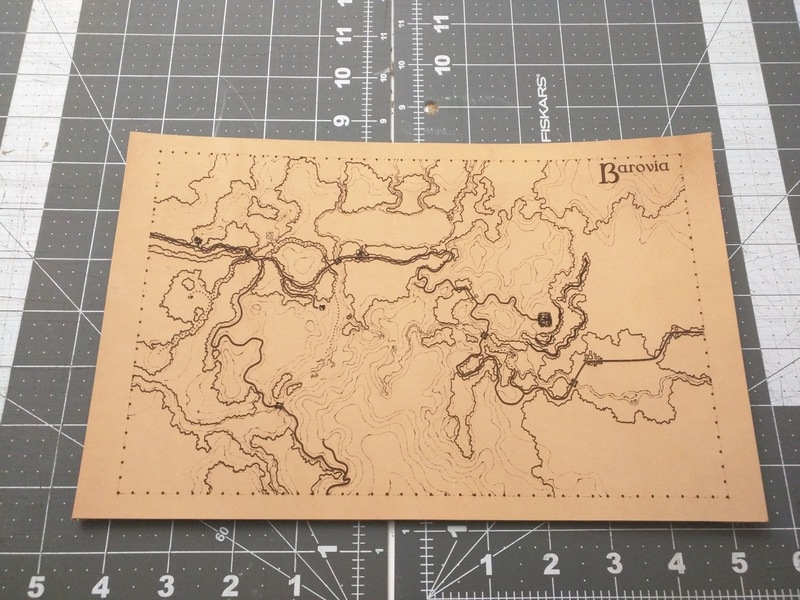 I redrew the coastlines by hand and inked them up nice so they'd scan into the computer. 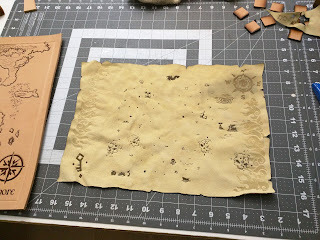 Then came lots of testing to see what worked and what didn't with the cutter and all the different types of terrain. Forests in particular were tricky but ultimately I would up going with a fairly traditional approach. From there it progressed like most maps. After it finished casing I did the carving and added some of the color back with some tinting. The overcoat wound up being thicker than I was expecting. I was planning on the color being about half as strong as it wound up being. But most of the tinting still comes through to some degree so I can get away with making a note to dilute the get a little further next time. 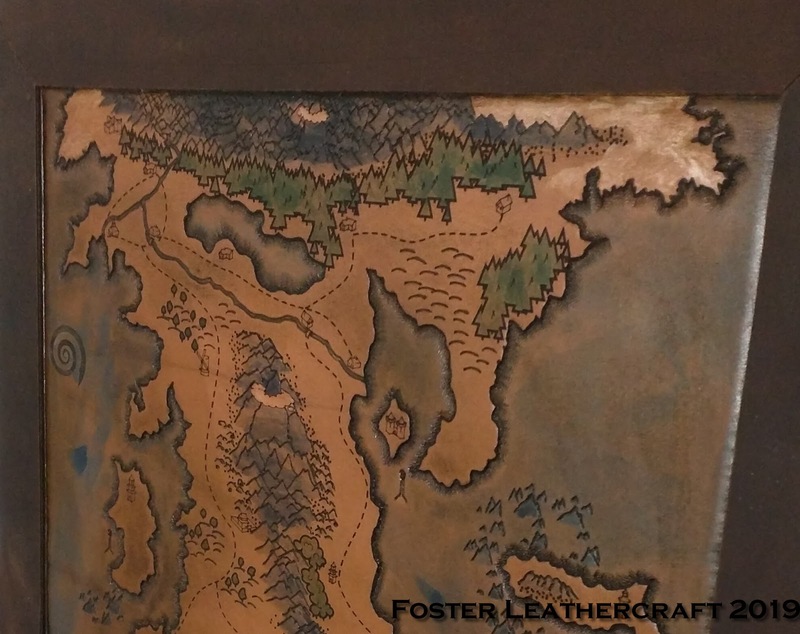 Then comes the assembly stage, where the leather gets stitched down to some MDF and frame gets glued on to get it all purdy looking. And that's how we get a damn fine map! 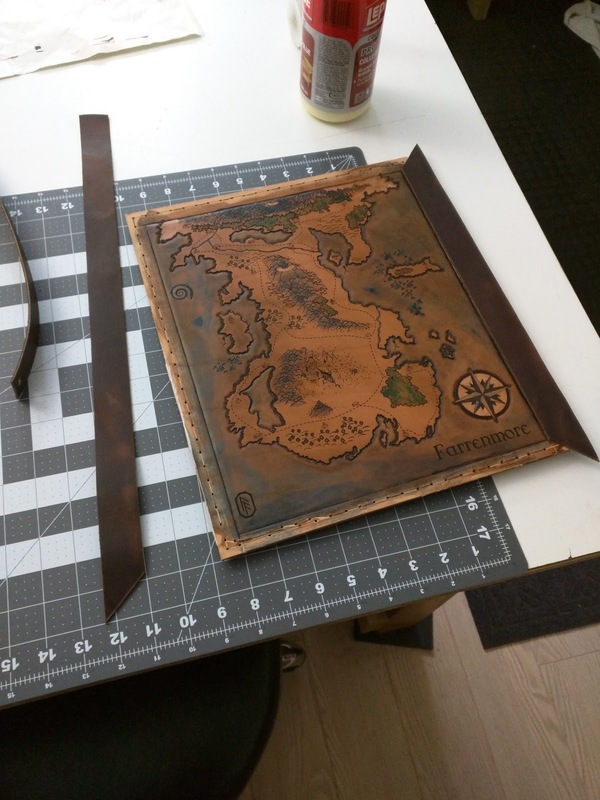 Way back in 2016 I decided to invest in a Glowforge laser cutter. 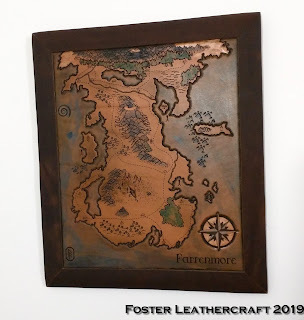 If you're unfamiliar with Glowforge, they were trying to make the giant, room-sized laser cutters used industrially a little more home friendly. They certainly succeeded at that but the four figure price tag and long production delays are probably going to keep them from becoming a routine household item. 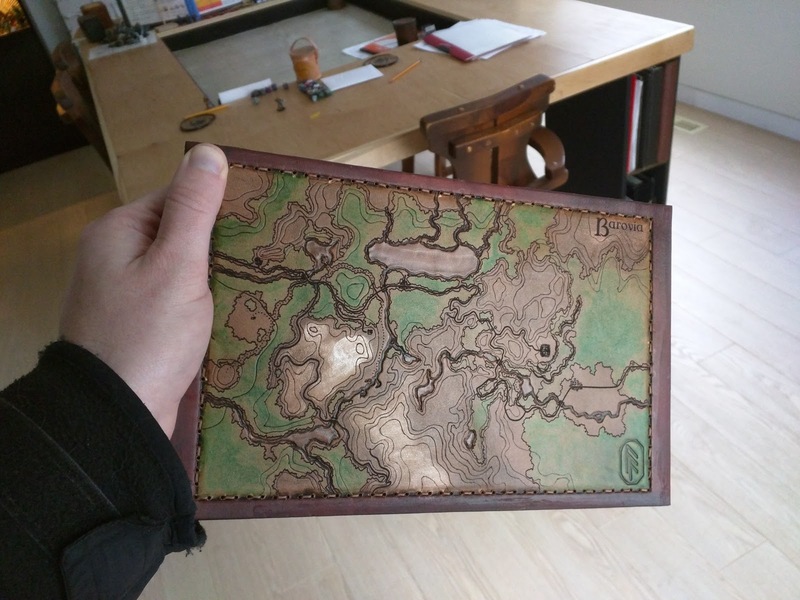 Those delays, combined with the ~30 miles from here to the border, are why I just received my Glowforge right after New Years when they've been shipping in the US for a couple of years now. 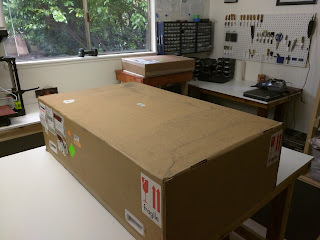 The box is pretty huge and finding a place to stow it (so I can safely pack the thing if/when we move someday) is going to be a challenge. Fortunately I've been keeping a spot open for the laser ever since I'd learned it was on its way. In essence the laser's just going to burn away material and that makes for a fair amount of exhaust. 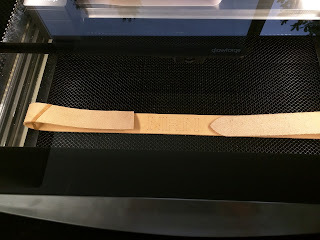 So there's a hose I can drop out the nearby window to direct that exhaust safely outside and avoid the worst of the burnt hair/char smell that comes with firing a 40W CO2 laser beam at leather. 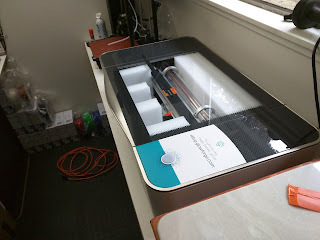 The Glowforge is really pretty optimized for working on flat materials that'll fit in its 11x20 bed. My primary purpose in procurring the laser was to score the drafts and designs I make directly onto leather without going through the whole messy ink transfer business. I knew this would work in principle but that's still a far cry from knowing it works in practice. I was able to test it pretty quickly with a shoulder strap and it worked every bit as well as I'd hoped. 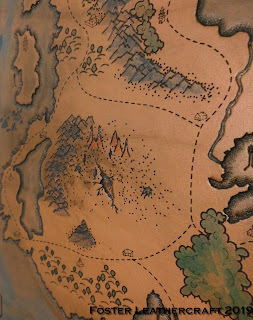 Maps are a helluva lot more complex than a monogram though and they're the most susceptible to the foibles of ink transfers. 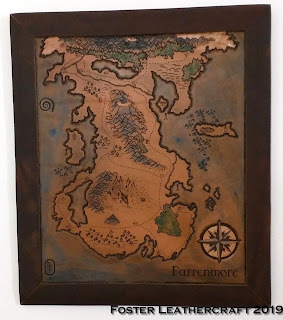 So I took an opportunity to update our wall of past campaign maps by adding Barovia. All the laser cutter's really doing here is taking the draft I make on the computer and tracing it onto the leather. 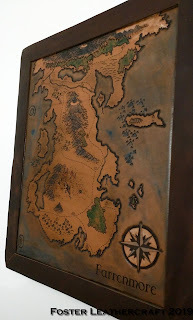 Then I come along and do all the carving and staining that makes it a neat looking map. 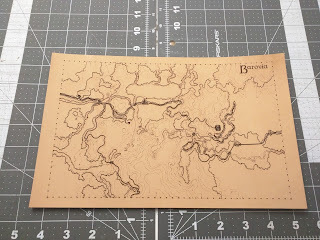 Barovia's a little bit of a weird map for this with it's topography but I was really happy that all the teeny, tiny little buildings came out awesomely. 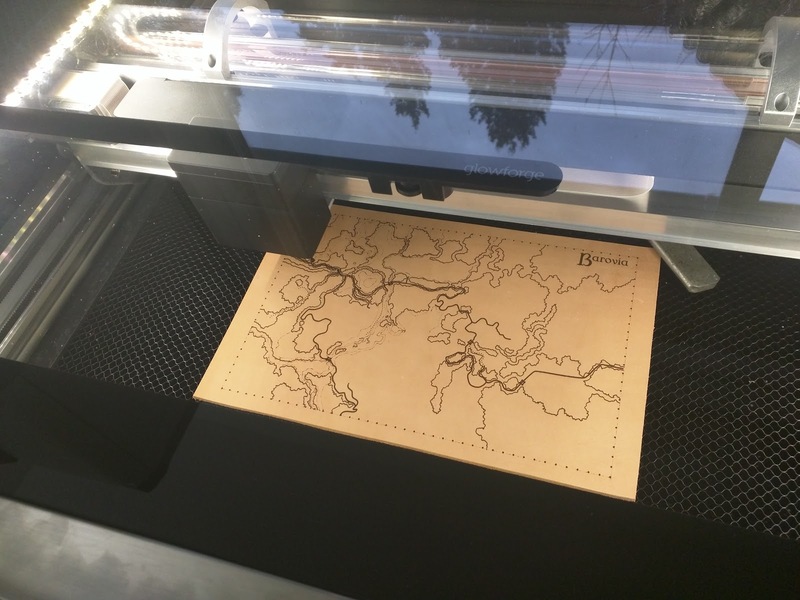 And, of course, a laser can do more than etch lines on leather. I have a few ideas for new product lines to work on this year. First up was a personal project though. For a long time I've wanted to have some woodsy pictures of the dogs I've had so over a weekend I was able to process some old photos and burned them into some wood to make an awesome little triptych. I did a little manual "post processing" to bring the dogs out of the background more but I'm quite happy with how these turned out. And once I figure out some details (like material supply >_<) I'm looking forward to putting a similar product up on the shop.